Boat Trip: Free when you book online. Speedboat via Comino Island Caves and back to Malta. Additional Information: The speedboat via Comino Caves to return back to Malta operates subject to suitable weather conditions. In the event that the weather is not suitable you will return back to Malta by ferry. You will be picked by regular transport for a transfer to the Gozo ferry terminal. The short crossing to Gozo takes 25 min en route passing the island of Comino. 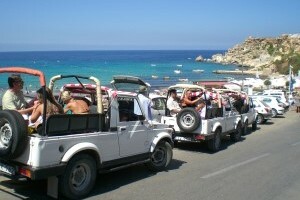 On arrival in Gozo you will meet the Jeep Safari tour leader. Simar Valley, Qala Belvedere, Salt Pans, Ramla Bay (time for a swim during summner), Marsalforn, Saltpans, Ghasri Valley, Limestone Quarries, Kercem Heights, Xlendi Bay and Sannap Cliffs. This tour is suitable for those that enjoy a touch of adventure and enjoy exploring the scenic routes. The tour is a lot of fun however can be bumpy at times. You will return back to Malta will be by exciting speedboat via the Island of Comino and the caves. Transport will then return you back to your hotel from northern Malta. We were lucky enough to get the speedboat trip to Gozo as well as on the way back, which was fun. The Jeep tour of Gozo was very enjoyable and really interesting. Maurice is a great tour guide, he is local so very knowledgeable on all things to do with Gozo, and very entertaining. Gozo is a beautiful island with so many different parts to see, we would recommend the trip to anyone visiting Malta. The Blue Lagoon is very pretty although the sea was a bit too choppy for us to get very close, but the sun was shining and we enjoyed every part of it. Great tour and friendly tour guide. Love it. Great value for money. Well organised and the guide Lewis was fantastic great day out for all the family. We all enjoyed it and would reccommend to anyone. Really enjoyed tour, great and informative guide, Johnny, loved the optional boat tour. Excellent tour, ideal if you don't have much time to explore. Well worth it. Got very good guide, who told us everything about Gozo, went around the island, visited the most famous places, churches, cliffs, salt baths... stopped for a fancy lunch, got a chance to swim in an open sea and came back with a speed boat by visiting Commino island caves, stunning! Worth to go! Nice trip overall. It happened that we had a ferry delay of ~1h but the return boat trip was also moved 1/2h later to recover some of the time. The jeeps are mini suv(s). It happened that my wife and I were in one jeep together w another 4 tourists + driver so I was sitting w other 2 on a back bench fit for 2. I'm not that fussy so I tried to enjoy the beautiful sites of Gozo and not bother about comfort or rough suspension over road potholes. I guess would have been an option to call another jeep and redistribute the larger group but we were late already so we were OK-ish to just squeeze 3 on a bench. The Gozo sites are picturesque and the driver/guide was helpful sharing interesting facts about the visited areas. Besides lunch, which was OK, we visited Dwejra Point caves by small boat (Eur4) and on foot some gift-shop, Our Lady of Ta' Pinu Basilica (under construction outdoors) and the Cittadella of Victoria. The boat trip back to Malta island was pleasant visiting the Comino Blue Lagoon area. It was a full day, passed so quickly, with nice memories and I recommend it for anyone looking for outdoors fun. M.V.C. Good but a little hurried no time to see some of the advertsed attractions.Overall was good. everything perfect, time table, pick up, tour etc. The good: the driver Maurice is a very positive character and speaks very good English. He is very proud of his job, very knowledgeable and very enthusiastic. The bad: it's a bit rushed. Not enough time in the Victoria Citadel; we were given 20 min but I wish there was 40min. I know the guides have their schedule to follow, but it feels like there are lots of things packed into this tour. Thank you for your comments. 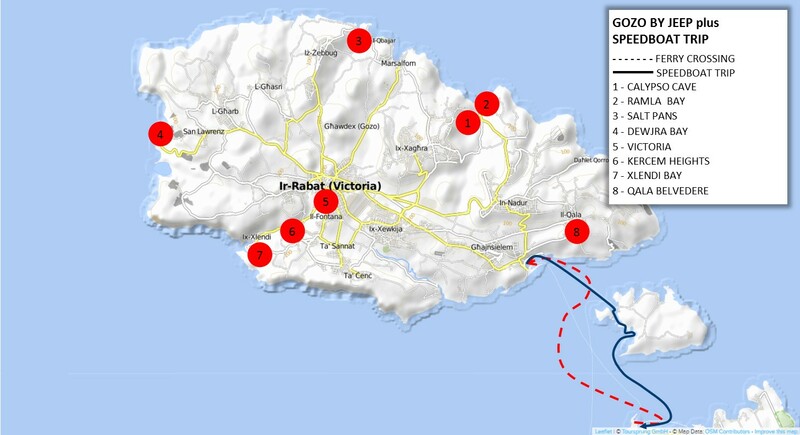 I can understand your point about lack of time at The Citadel in Victoria, however please understand that we visit 8 different places during this tour, then we have a lunch break plus the speedboat via Comino caves...the idea of the tour is to show visitors the main highlights. Many people return back to Gozo to spend more time at the places they really enjoyed such as Victoria, The Citadel, Xlandi Bay. The alternative to this tour would have been a guided tour which would have included much more time at these places, including a full guided tour of the Citadel. The good parts: - Easy, convenient pick-up from major hotels on Malta. Air-conditioned van. Friendly, engaging driver. - Logistically well thought out. No problems with ferry to jeep connection, nor return boat ride. - You will see the majority of the highlights on Gozo. - The pace is quick, though with just the right amount of time for a few breaks and photo opps. - Informative jeep drivers. - Excellent value. Not so good parts: - Sometimes a bit rushed, though considering the total sites seen, it balanced out. - Wanted to see the Azure Window from the preferred southern view. While the jeep driver obliged a quick stop, it is quite a hike to the water from the parking lot. So, in deference to the others in the jeep, I didn't get a photo of what I understand is a great view. Maybe the tour could throw in a brief stop for this great natural site. Loved the tour and the speedboat trip. I would prefer longer stay at the Azzure Window though. This tour is fab, guide was excellent & we had lots of fun. Got to see all around the island & lunch at the restaurant was excellent. Only complaint was we did not have enough time at some of the places however this tour gives you a taste of what the island has too offer so that you can come back and explore at your leisure. We took a long time getting started (7:45 AM pickup, long wait at one hotel, then a very long wait at the assembly point to get everyone's language sorted out...finally to Gozo at like 10:30), but the jeep guys were wonderful. They showed us a lot, gave enough time for photos, the lunch was very good, and the optional boat trip was great. The speedboat trip back was not much at all, but it was preferable to the long process we would have had on the ferry. I can absolutely recommend this trip, if the weather isn't extremely hot or cold/rainy. The island of Gozo was absolutely beautiful. Our driver, Maurice, was very knowledgeable and kept us all entertained with his information and wit. We thoroughly enjoyed our Gozo tour and recommended it to many people (who later booked this trip too). The tour was organised well and the guide/driver was excellent. However, I did not feel safe on the jeep especially when three people were sitting in a row.